Do you like reading newspaper? or Would you like to get twitter and Facebook messages in newspaper look? Paper.li will let you read facebook and twitter messages as a daily newspaper. To create newspaper you can log into the website with either your Facebook or Twitter login information – you can decide for which service (either twitter or facebook) you want to create your newspaper. 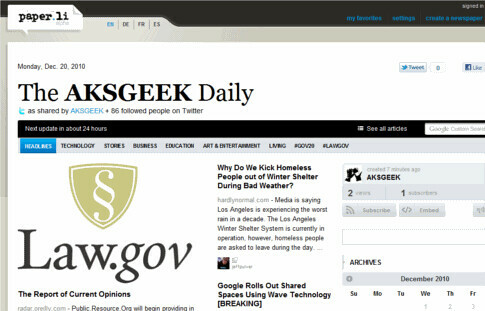 I created the page called “The AKSGEEK Daily” by using my twitter credential and allowing the connection from small river’s paper.li. When I successfully logged in I had the options to create a newspaper based on a Twitter user, a Twitter tag or a Twitter list. One more good thing about Paper.li is that your newspaper updates automatically depending on the preferences you set in setting tab. I like Paper.li because it organizes your links and content in more readable manner and lets you share it with the rest of the world. Here is a link of my newspaper I created. Do want to tell some thing more about Paper.li? Do you like it or not? Share with us.